Players try to swing the giant wrecking ball to knock off other opponents. 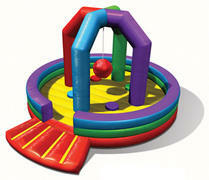 The inflatable Whacky wrecking Ball game the newest cool game in kids party fun! The players stand on the inflatable pedestals and swing the Wrecking ball, "whacky ball" or "demolition ball" to their friends on the three other inflatable pedestals and try to knock them off. The last one standing -- wins!! The "Whacky Ball" is inflatable and is suspended on a cord that is just the right length to reach each of the pedestals and while it is soft, when combined with the instability of the inflatable mound, it can certainly cause some fun "crashes" onto the inflatable base!